It seems that yesterday the cyber group of hackers known as Anonymous target what it said was the Israeli government websites as a kind of show of solidarity with Palestinians. In a relatively rare harsh and thuggish mistake this group suddenly went all political and far, far away from any type of liberal activism that is so identifies with those who promote freedom, especially on the internet. A few things stand out on this campaign against Israel which are so unlike Anonymous that one must ask himself if this is really the same group, or is it someone else posing as the Anonymous group, and if so – why don’t the real ones stand up to voice their concern over this cyber attack. The first thing is the “why” factor, the cause for this action, at first it was claimed (weeks ago) the it is the disturbance of the cease-free agreement that triggered this action, however the Palestinian side has clearly violated this cease fire , even on the day it was signed, so no real cause here. Second is “solidarity” with the Palestinians, are we talking about the same group of people who persecute gay people, torture, execute and drag bodies around the streets without trial or any kind of legal process? 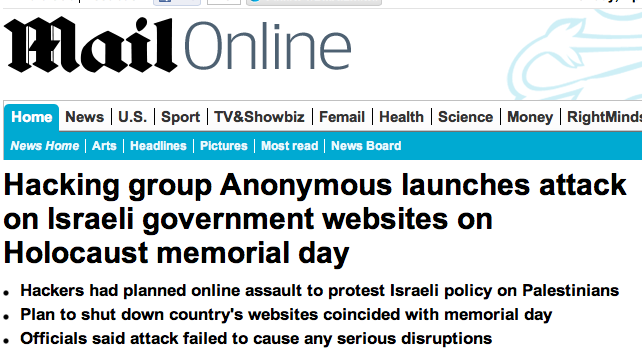 The other thing is the timing, seems that this attack, planned weeks ago, is set on the Israeli Holocaust memorial day, and to make things even worst some of the Anonymous activists claim that their action is meant to “wipe out Israeli presence off the internet”, not a very good choice of words. So, is this really Anonymous doing? if it is this must be a sad moment, because it symbolizes the fall of one of the bravest and coolest internet protest groups into an ideological abyss, and onto a work-for-the-popular-vote kind of thuggish attitude. The result of this attack on Israeli sites resulted in many regular, privately owned sites failure and very little damage to government sites, it also showed the language and graphic skills of the hackers who went to work on this, and unsurprisingly it features the Arab language on most case, and on other very clear religious symbolism driving a clear line between this attack and its probable true nature, the hare of Jews and the Jewish state. Anonymous Targets Israel or simply after Jews? 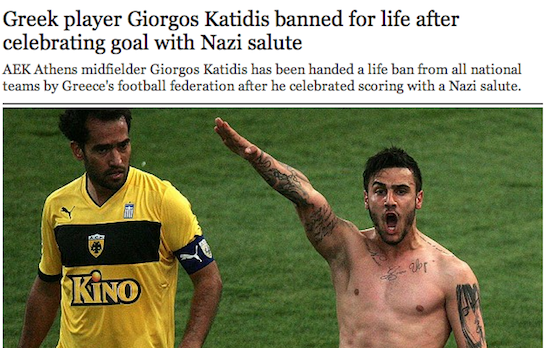 Greek player Giorgos Katidis just got himself banned for life from the Greek national team after he celebrated a goal with a Nazi salute, he claims he does not know what it means but if he really does not know what this means, why the hell did he do this? Unfortunately this whole thing is a micro example of what is happening with Greece. The whole thing starts with the impossible, incredible financial situation, one that clearly means that at least one generation of adults in Greece today will not know financial safety – or even mild stability, for their entire lives. Maybe this is the fault of the whole Greek culture/society in the last 20-30 years, but this means very little to those 20-30 year olds that have to watch as their future is wiped out, forged in chains to the too-big-to-ever-end debt to Germany. This young generation did not enjoy the party, but will pay with years of work for it. So with things going worst the fascists are never too far behind, blaming the Jews, Muslims, Africans and anyone that they can find who is not just like them in the situation, enter Golden Dawn, the Nazi party, and enter symbols that come with the ideas. 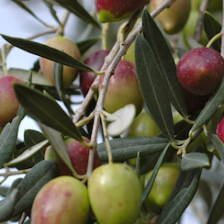 So some people know they want to have their financial future in their hands (which they are more than entitled to) they know that the golden dawn takes care of Greek – but they do not know that in the end of all this there is one simple idea of humanity getting rid of “lesser humans”. Back to our soccer player, look at the guy on his side, he is from the same team – he looks stunned, the funny thing is that the guy on the left is only slightly darker skinned to the one doing the salute, the one doing the salute will never pass as a Nazi in the “old country”, his blood is far from being pure. Here is Greece 2013, about to do a gesture (or worst – acts) that will leave a large part of its own population stunned, and might get it to be banned from all kind of things. Ignorance is dangerous, especially when it serves as a bridge to simple solutions. If Europe continues to turn its back to the young Greeks and leave their future in the dark this will only get worst. This is not a new story, many countries that were unfortunate enough to be located between the former Soviet Union and Nazi Germany suffer from the inability to celebrate World War II events properly, in some of the cases because their blunt cooperation with the Nazi regime was as close as you can get to being partners in crimes against humanity and in other cases because of the confusing battle against fascists on the one side and communists on the other. This is somewhat the situation in Latvia, where war veterans seek the description that would make them as brave as they can possibly be and less tied into the old Fascist ways of Europe. The equation is simple, in the beginning they had to fight the soviets from taking over, after that the Nazis and in the end the many years of Soviet oppression, it is no surprise that most of all these people want to be less associated with the soviets than any other nation or political party, which draws them closer to the default… which is the Waffen SS. Young Latvians were forced into recruiting into the Nazi armed forces, maybe a part went willingly but it is sure that most did not want to fight a war that had nothing to do with this country, or its ideology. However once in the ranks they did fight and die for the Nazi war monster, and some continued to fight the soviets after the war was over. Now these people have a day to commemorate their actions, on March 17th they march in memory of serving in other people’s armies and dying for other nation causes – as demented as they could be. 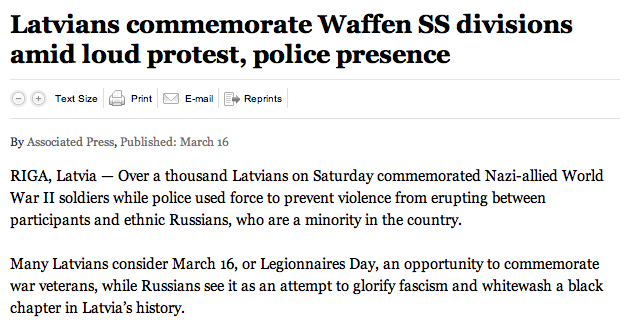 This causes some reaction on the Russian side, because no one wants to see people who made battle against your country march and glorify that event, the few Russians available in Latvia protest against this march. What does actually leave us with? That in todays world it is more important to be a veteran than a war hero, what you fought for (or why you did that) counts much less and is of less concern to anyone, the only thing that matters is that nations are happy to sacrifice the facts and honesty for the glory and fake impression of old battles. After all, if you have been to the game and suffered the injuries, why not tell everyone you played fair and won? We know UCL from past posts, especially from the one that warned this top rate university (globally) of what is going on in its grounds when an Islamic association caused trouble on campus, it is only natural that this is what follows, because there is a high price for the lack of attention to the religious powers working their way into forcing everyone back in time – to the stone age. A week ago, we are told, a debate on University College London campus was held with the notion of debating Islam against Atheism, the audience was stunned to discover that guards (yes, guards) were on site to make sure that male and female attendants will be physically separated. Something in UCL’s main hall must have cracked, that famous ghost of Jeremy Bentham must have gone wild with anger to discover that the university that he fathered, the first of its kind – to accept all without discrimination, and take full advantage of human potential has now turned to a backward, barbaric institution that does not believe women are equal to men, and even worst – that men need to be distanced from women or that will not be responsible for their actions. How entitled the people of London and England been for the past hundred years that they let this fundamental human right slip away from them, how self hating they needed to be to get to a point that a bunch of religious nut cases can make their way in one of the worlds most celebrated educational establishments and implement the same rules that this university was created to crash?. This wake up call was just about enough, and UCL announced that it is halting the activity of the student body that organized this specific event, probably for breaking each and every point of the university charter. So the official boss washed his hands off this, and the problem is solved. Also note that the “atheist” debater refused to take part of this barbarism and threatened to leave the debate unless humans beings were allowed to be sitted as they wished and not based on their gender. One last thing, who gave Muslims and Islam the total property of all religions? Why, or rather how is it that Muslims feel that they are the ones to wage debates on atheists, when this kind of debate should have in it representatives of the two organized religions that preceded it (by many, many years) and who are clearly the full basis for Islam. Some went as far as to argue that the Koran is a simple plagiarism of the Bible and New Testimony together. The answer is simple, with every passing day we witness the violent and ultra aggressive aspirations of this neo-Islam, to wipe out all other religions and take over as the only religion out there, which is in line with its totalitarian and dangerous philosophy.